Opening the cover, I flip through a few pages and find the article. Staring back at me is a picture of my buddy David. The article is fascinating. So much so that I read the entire thing on the spot and buy a copy to take with me. And that’s saying something, because I don’t buy running magazines any more. In the article, David speaks of lighthearted things, such as running a race with no pants and a mustache that smells like spring time. Yet, amidst the funny stories lies a deeper, darker tale of post-100-mile lows. “During a race, I know it’s uncomfortable and it doesn’t feel good but I remember there’s always a finish line. But after the race, I don’t have a finish line,” says Laney. His words hit home. Almost too much. I’m in the midst of a four-hour drive across the mountains of Colorado and it’s as if Laney just summed up the thoughts that have been swimming around in my head since the recent UTMB. It’s interesting. People spectate from afar and see lots of laughs, smiles, guts, and glory. They see athletes striving for greatness and ‘living the dream.’ Don’t get me wrong, a lot of that is very, very real. At the same time, however, there is another side to it. There is a side that is smashed to bits, and I’m not talking about sore quads or swollen legs. Quads rebound. Swelling subsides. Aches and pains find relief. But the mental damage, that’s tough. Hot tubs and ice baths don’t relieve a muddled brain. Try as I may, the head tends to keep on spinning. Returning to my truck, I hang a right on Highway 9 and head south toward Silverthorne. It’s funny. A few years ago, I’d be a kid in a candy shop driving through these mountains. At this moment, I just stare at them and feel (almost) nothing. It’s really strange and sad. In my mind it’s such a contradiction. I’m a mountain lover. A caretaker. 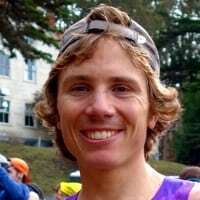 An ultrarunner. Pretty much everything I do involves mountains. And yet this is where I am psychologically. Surely it’s not permanent, but even if just for a moment, how can this be? I scan the radio for something good. I call my parents and chat with them for a bit. Shortly after hanging up the phone, I’m parking my truck and packing up my things for the final leg of the journey; a 6.5-mile run up the Barr Trail. It’s dark, but my headlamp shows the way. Not that it’s entirely necessary. I’ve run the ‘driveway’ so many times that I could almost do it blindfolded (maybe). But the headlamp is helpful and I keep it on. Arriving at the cabin, I let myself in, startling my buddy Jonathan Lantz, who is upstairs reading a book in his loft. He climbs down the ladder and we chat for a bit. Standing over the dinner table, which doubles as a trail map, he shows me where he went exploring on his run that day. He must be excited about it because it’s late and we should probably both be sleeping. Eventually he returns to his loft and I to the floor to do my core routine. Afterward I find leftovers in the fridge, eat them cold, and head to bed. Around 6 a.m., we’re up making coffee and cooking pancakes for the guests. After breakfast we move on to other chores; sweeping, mopping, cleaning bathrooms, helping day hikers, and more. The tasks are simple and mundane, but they give me a sense of direction. I have a goal, somewhere to direct my attention. It’s a nice distraction in a time when my mind doesn’t know quite what to make of things. Later that afternoon things quiet down and I head out for a run with Jonathan. We decide to explore a new-to-me part of the mountain. I’ve lived on Pikes Peak for over two years now, but there is still a lot to be explored. We head down the Barr Trail for half a mile and then hang a left toward the ‘three ponds.’ Coming to a fork in the trail, we take the less-defined path on the right and splash through the swamps. On the other side of the swamps, we climb an unnamed peak. The views at the top are magnificent. You can see both Pikes Peak and Manitou Reservoir. Jonathan finds a small log book tucked away in the rocks and we open it up to see who has signed it. There aren’t many names in the log and a lot of them are from more than 10 years ago. Usually I don’t care too much about peak logs, but this one feels special, so I sign it and tuck it back in the rocks. Scanning the landscape, we decide to cut a straight line for the valley below, hoping to intersect with a trail that we think is somewhere below us. Sure enough, after a bit of scrambling and steep downhill running, we pop onto a trail. It’s funny to me how there can be such well-defined trails hidden out here in the middle of nowhere. Running here feels new and exciting and we follow the trail until it disappears. Knowing that the Manitou Reservoir Trail is somewhere below us, we turn and head straight down. With Jonathan trailing a short ways behind me, I let out a hoop and waited for him to holler back. Sure enough, just like runs in our home state of Pennsylvania, he returns the call. And that is it. That holler felt like a piece of the puzzle clicking into place. I’ve logged thousands of miles in these mountains, most of them alone. I’ve gone home to Pennsylvania and ran through the woods hooping and hollering with my buddies. I’ve even returned to Colorado and let out a hoop only to have it echoed by silence. But on this day, and on this run, someone finally hollered back. It felt so good. It meant someone else was out there sharing the journey with me. Someone I could talk to, explore, laugh, and struggle with. Someone who could holler back (y’all). I’m not claiming to have found the cure for the post-100-mile blues. Those days spent routing through the wreckage are still a bit (or a lot) of a mystery to me. Laney said it well in that Trail Runner story, “I think people don’t realize how bad these races are for your body. They do extensive damage; you are running hard for such a long time. Your brain chemicals get really out of whack after doing something that hard.” That statement makes sense to me. I’m no psychologist, counselor, therapist, or mental-health expert, not in the least. I don’t really know how any of this works. Part of me wonders if it’s just some sort of self-fabricated pity party. Would I feel this way if I won? Do European runners experience this sort of post-race funk? These are the questions I ask and the answers I lack. Not knowing the answers, I wonder if I just need to rub some dirt in it and pull myself out of the funk by my own bootstraps. That sounds like a simple fix, and yet, some days that dirt feels really abrasive and those bootstraps feel really heavy. As I talk to others and read Laney’s interview, I can’t help but feel that these feelings are anything but abnormal. I was in a funk for probably about a month after the 2015 UTMB. That was a rough time and may have been connected to more than just the race. In the end, I came charging out of it and stormed my way to a lot of really good things. This time, I feel like the funk isn’t as bad and will be a lot shorter. I would like to think that I can get better at it. That someday I will be able to run a 100-mile race and be totally fine afterward. That sounds nice, but at the same time maybe that’s not the goal. Maybe the funk, within reason, is part of the experience. Perhaps it’s just another mountain to climb. Another medium for developing one’s character. Another way to learn, grow, and develop. And so, as I move forward from this UTMB, I am choosing to learn from the funk. I don’t want to just wait for it to end. Instead, I want to search for meaning within it. I want to learn how to deal with it, handle it, and maybe even embrace it. I don’t have to totally master it, but I want to search for the good that can come of it. That appreciation for community. That realization that you can push yourself that hard and still be standing. That ability to let out a hoop and let the holler bring you back. Do you experience post-race or post-big-event blues? What are they like for you? Have you learned to cope with the psychological challenges that can accompany the completion of a big goal or event? “For me, as for so many runners, there really are no finish lines. I think you and David sum up the post 100 miler psyche pretty well, Zach. It’s almost as if, although our bodies have stopped running, our minds are still out on the trail anticipating the next low, keeping us down so that we are prepared for it. But being in the presence of others reminds us that the race is over, that we can have fun and explore again without the toll that racing has on us. Ultras are so intensely personal, but I think the cliche Into the Wild quote is “Happiness is only real when shared”. Love it, thanks for sharing! with failure comes greater success. I have nothing else to say. Get back at it Zach, it’s just running. I can relate on a much, much smaller scale. After running a marathon and having a blast, I got into a funk a couple days later. It was a “what next?” … “wow, that was over fast” sort of funk and I was truly having a case of the blues. It seemed like I had spent a ton more time training than racing and now it was all over. Now, I’m trying to embrace the fun in training more and also, on race day, to really savor it. Discussing my funk with my husband, he suggested that I find another race to train for. Nice article! My first 100 is on the horizon (next weekend), but I definitely have felt this after 50 miler/100Ks! A few years ago, after one I ran another 50 miler and hated every step of it. It’s interesting that you mention you felt better with a friend out on the trails, because that’s what eventually pulled me out of it. I ran an UltraPedestrian 50K (unsupported) route with a friend, and we just enjoyed being out there, seeing all of the natural beauty, and enjoying each other’s great company. THAT sparked motivation within me again, and I chose the next goal. So, I agree with you! Camaderie plus new trails seem to help recenter me. We’ll see if it does the same after this upcoming race. Maybe the funk is necessary and part of the natural cycle to give you time to reflect, and to keep you from jumping back into the grind of training too quickly. I enjoyed this piece very much! Interesting insight into post-race experiences, quite a bit like my own after graduate school. Thank you for sharing! Each 100 mile race I have done has been followed by a great high for about a month or two. I love them even though they deplete you so much. My only goal is to finish them and enjoy the recovery period. On the other hand I’ve run 100k events or less and expected some good results. These have left me with some not too pleasant lows. I can only put it down to expectations. Now I just run with no targets except completion and the results look after themselves. I had a very similar experience after the 2013 UTMB. The body was fine but my mind was drained. Interestingly, as well as the usual night time hallucinations (I was out for two nights), I experienced very different post-race (and post sleep) hallucinations. As I looked at someone, blue tattoos would appear on their face. I was wide awake and they were extremely real. There was clearly something going on in my brain. Since then I’ve done some events but my running mojo had effectively disappeared. It felt as if anything I did would never compare. Four years later, it has taken a move of home to the Lake District in England to reignite the desire to get back into the hills. Think speedboat Karl hit the nail on the head, it’s supposed to be fun, it’s just running. That should be “whoop” not “hoop”, I thought you were shooting hoops. There is a similar phrase that maybe was mixed, “hoot & holler”. Zach, do European races make you feel worse than ones in the US? And ultimately you probably do know what’s next, ideally you have a race calendar lined up and ready to go. Just run and hike your way through it, whether it’s alone or accompanied. 1. Always have an epic run or race on the calendar so you have something to look forward to (plus there’s ski season right around the corner…). 2. I wonder how much of an affect caffeine loading and painkillers have on the mental state after a big race? I don’t take either, and have not experienced anything like what is described here. That was interesting and really well-written. (I guess Zach Miller is not just a pretty face!) But I didn’t come away with a lot of answers. I get post-race blues big time. And the bigger the race, the bigger the blues. For a professional/elite athlete, who focused on fewer, more important races, I imagine it’s really rough. I think the first thing is acceptance. Know that it’s coming. You can’t dodge the approaching storm entirely, but you shouldn’t be blindsided by it. Then, as Zach describes, you need to do things that make you happy. Go explore somewhere new and beautiful. Run with a friend. Run with your dogs (I find the company of animals particularly therapeutic). Spend quality time with your family. Socialize. Eat and drink without guilt. Try completely new things. But be prepared for activities you normally enjoy to be less satisfying than normal. Psychologists call this ‘anhedonia’: one of the classic manifestations of depression. Again, knowing this is coming helps. Personally, I like to race frequently. It often means that I don’t perform at my peak in any one race, but it does limit the mental fallout. After each race, refocussing on the next, immediate challenge is therapeutic. Thanks for this article. I love the fact that it doesn’t give solutions, I hate when people want to fix everything and move on. There’s time to have the funk, it’s normal if it doesn’t last too long. As Zach mentioned, it’s important to talk about these issues and no just show the finish line photos and videos and the smiles. I don’t have the 100 miler experience. I ran only a 70k ultra, which went great, no blues, but a couple of months ago I did a 100k multi-day race. The day after it was fine (we had a family event, so I guess adrenaline kept me going) the the second day I totally lost it: spend half a day in bed and had the blues big time. Then it really hit me how much I was asking of my body and how much does it cost. I think the price you pay afterwards is much bigger than the training and race combined. I was lucky that the funk lasted only 2-3 days. Yes, running 100 miles is cerebral demolition. As a physiologist, I think it’s largely an adaptive response to prevent further damage and allow the body to recover. A variation of “sickness behavior” we feel is due to a neural-immune response. As a runner, I just acknowledge it for what it is, how it’s part of the process and just ride it out. And keep things easy (mentally and physically) while I do. This really resonated with me. I ran UTMB this year also. It was a dream race for me for 10 years, I trained like an animal, left it all out on the trail, and the race went really well. Post 100 is especially tough and wondering how I can ever top this. Trying to just enjoy taking it easy and spending time with the family. When I feel the fire burning for something else will get back at it! thanks Zach. Thanks for coming across as human and not just a machine. Full of respect for what you do man. I am a scientist and this is a completely plausible hypothesis. We know inflammation and the immune system is what brings about “sickness behavior” – ever stop to think about why you want to stay home and shut yourself down and not talk to anyone when you’ve got an illness? Thanks for sharing, Zach. To me all you describe is just … being human. You can’t have the ying without the yang. I find nature to be perfect in how it balances. We need physiological and chemical recovery from hard endurance efforts (a far larger concern would be if that is not happening). I personally take refuge/relief when the PUD arrives (post ultra depression) as I know my brain is going through the re-balancing process. Just look at it is as not only temporary but essential. And use the recovery time to do things that your intense training blocks leading up to large ultras did not allow you to do. It might be related to goal fulfillment. Once you complete a task, your mental capacity is released for solving another task. But since you usually don’t have an immediate job after finishing such an ordeal, you may experience some kind of emptiness or even depression. You have to take into account that your mental capacity was focused on just one main objective for months. Its my experience that when ever I have been working towards a big goal in life; and achieving that goal has taken a sustained effort – after the euphoric celbration beers; there ALWAYS seems to be a feeling of anti-climax; yeah a type of depression feeling of loss. I agree old Zac writes much better than his running style suggests!